Each year at around Eastertime the seabed at sites throughout Dorset, is transformed in a spectacle of nature as tens of thousands of black bream, Spondyliosoma cantharus, arrive to breed. For divers the seabed is transformed into a moonscape of craters and for anglers, fishing boats head to sea to catch the fish which are prized for sport and/or as delicious seafood. Despite this dense, breeding aggregation, divers rarely encounter bream underwater – the fish are shy and often move away until the divers have gone. For a better understanding of natural breeding behaviour, together with Matt Doggett, we placed video cameras on the seabed in the nesting areas between Kimmeridge and Poole Bay. Find out what happens when the divers are not there? 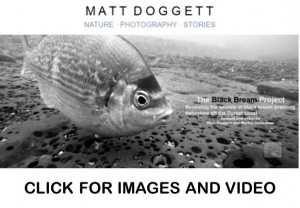 What is life like on and around Dorset’s black bream nesting areas? Watch the male fish, start to build their nests, keep other males away and attract passing females. See the eggs that the male keeps clear from sediment and any would-be predators until they hatch. And observe the predators taking advantage of an empty nest if he should move away.